University students are generally fashion-conscious. 20's trends show their own characteristics and contemporary situations they encounter. [20's Choice] aims for analyazing these by looking through twenties' current trends. Recently, the number of marathon events and their participants in twenties are soaring. 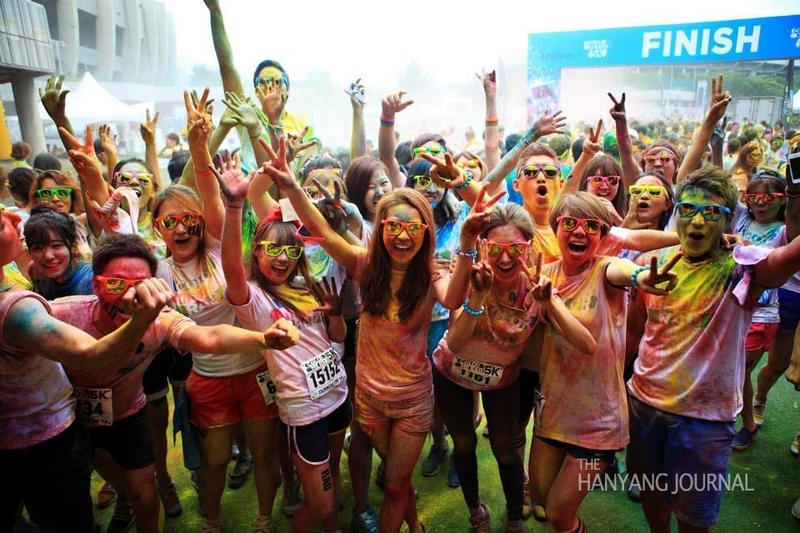 The Hanyang Journal sheds light on twenties' craze for marathon festivals. -Ed. People often compare a marathon to a long and hard battle that one fights alone. “I could not agree more that a marathon is like a lonely and difficult battle. When I participated in a marathon race with my friends, we were so worn out that we came very close to giving up on what seemed like endless running. If I had run the marathon alone, I am sure I would have given up,” said Jeong Ye-seul, a Junior in the Department of Civil Environment and Engineering at Hanyang University(HYU) as she recalled her experience participating in the Incheon Marathon. Recently, marathons have transformed to become more fun and creative events for people to enjoy and not just viewed as torturous activities to be endured. 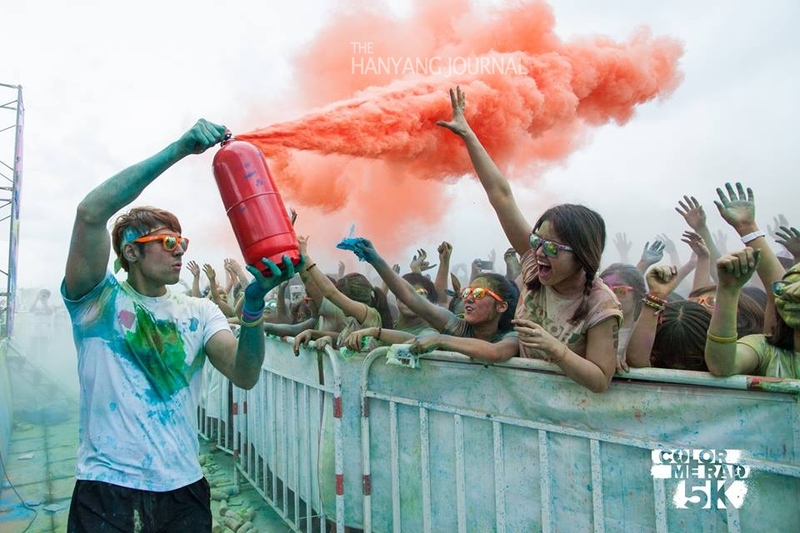 Here in Korea, marathons have become more diverse with various themes such as survival games as in the “Zombie Run”, or involving paint bombs such as in the “Color Me Rad” marathon. There is even an electronic dance marathon called the “EDM 5K”. Marathon races no longer have to be run alone anymore especially with the involvement of more as university students in their twenties who are increasingly showing enthusiasm for these events. The first marathon in Korea dates back to the Japanese occupation period. The first marathon record was set by Ma bong-ok, who set the record of 3:29:37 at the Chosun Shin-gung Competition in 1927. Also, perhaps the most famous of Korean marathon runners has been Sohn Ki-chung, who won a gold medal at the Berlin Olympics in 1936 but had to participate in the marathon event as representative of Japan at that time. As a result, marathons became a kind of outlet for Koreans to release their anger towards Japan and a number of young Koreans began participating in marathons. This was the start of Korean marathon history, where most runners participated to show their sense of national pride, and thus public enthusiasm grew. Marathons again became popular in Korea with the advent of the 1997 financial crisis. Middle-aged men who suddenly found themselves unemployed saw running as a major outlet for their stress and frustration. “Running a marathon had significance for Korean people at that time; it was a break from the negative feelings they were experiencing, arising from their hopelessness towards their futures as a result of the financial crisis. Additionally, running was a great way to exercise for free. For these reasons, a number of people who bore heavy economic burdens started to run marathons,” commented Cho, Seong-sik, a Professor in the Department of Sports Industry at HYU. The number of people in their twenties who participate in marathons has significantly increased in Korea. According to recent statistical data by Human Race, one of the most popular marathon societies in Korea, young people in their twenties account for 51.3 percent of marathon runners these days. Emil Zátopek, who was a famous Czech long-distance runner also known as the “Czech Locomotive”, once said, “If you want to experience a different life, run a marathon.” It appears that young students in their twenties are following this advice by making their lives more exciting and meaningful by grabbing chances to participate in marathon festivals, which offer diverse and interesting experiences. There are no finishing times recorded for Color Me Rad, a marathon festival that involves bombardment of colors. Each participant is like a canvas waiting to be dyed with color bombs of blue, green, pink, purple, and yellow. This marathon festival idea came from the Holi Festivals of Colors in India, where people sprinkle colored powder on each other to signify God’s blessing. The Korean version started in 2013 in Seoul, Incheon, and Ilsan. In addition to this colorful marathon race, there is also a marathon festival that has a DJ party after participants finish the main marathon event, the Electrodash event, which is a marathon that has electronic music. Which such fun packed into the festival programs, participants can expect to have a really enjoyable time. The Zombie Run, which is a marathon race that involves a game of hide-and-seek with a zombie theme, was launched on May 2013 at Yonsei University. It was well received and garnered many enthusiastic responses from the public. Contrary to more lively marathons, however, this one involves a heavy survival theme under the slogan of “Survive from Yourself”. The slogan and the general theme of this event are metaphors for escaping the zombie-like state that sadness and depression can lead to for those who are suffering from them. In this regard, at the Zombie Run counseling services were offered especially for those who were in twenties, and profits were donated to the treatment of depression.